Finally, some snow in SoCal! Let's hope there's lots more this winter to alleviate the drought! We have another rain session coming next week! One can only hope but it's a good start so far. Yup, same up here in the Bay Area & northern Sierra. Yup! Got a taste a few weeks ago in the San Gabes and a nice dumping last week with more this week. Safe to say we made it through another fire season! This forum: Older: Off to another adventure... Newer: Happy New Year! Traditional First Hike of the New Year! All forums: Older: For Sale: Mystery Ranch 6500 w/ NICE Frame Newer: OK--and now for the good news: Who's been nice? 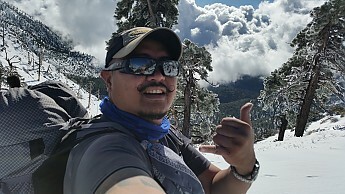 Topic: Finally, some snow in SoCal!